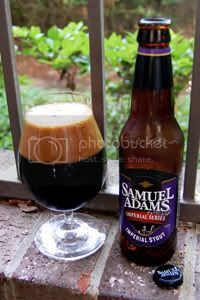 Somehow, I never got around to posting a review of the star of the Sam Adams Imperial series, the Imperial Stout. Allow me to remedy that real quick. Brewed in the Russian Imperial Stout style, Imperial Stout is one of the biggest and baddest brews Boston Brewing Co. has ever brewed up. The malt bill is huge, calling for a combination of Two-Row Harrington, Metcalfe and Copeland pale malts, Caramel 60, Munich, Special B, Smoked Malted Barley, Roasted Unmalted Barley, and Malted Wheat. East Kent Goldings are the exclusive hop used and everything is brought to life with the house ale yeast. Huge roasted malt character with smoky, chocolate, and coffee aromas and flavors balanced by an earthy English hop bitterness. Sounds about right, so let's dive in. Appearance: A solid black body with a big dark caramel colored head that leaves nice lacing. It certainly looks the part. Aroma: Rich and complex: bananas, dark fruit, bitter chocolate, sweet roasted malt and alcohol. Taste: The malt body is massive, bitter, and very roasty (almost burnt at times). Still getting some strong banana and general dark fruit flavors. Definite dark chocolate and coffee notes in the mix too. Plenty of alcohol to compliment everything, but never so much to step on anyone's toes. The aftertaste is big and roasty. Mouthfeel: Full and velvety body with low carbonation. Dries nicely in the finish. Drinkability: A sipper, but perhaps a little bit quicker than average for the style. Verdict: Imperial Stout is another solid beer from the new Samuel Adams Imperial Series. Miles ahead of the Imperial White, and a shade better than the Double Bock, this is my pick from the collection. Well done Jim, this is great stuff. This sounds delicious, I'll have to try it. I love a nice imperial stout.